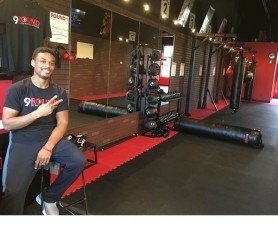 My name is Damion and I am the franchise owner of a 9Round in Bloomington, MN. 9Round is a 30-minute, full-body workout with zero class time, alternating daily workouts and trainers that help you every step of the way. I have helped people from ages 11 to 66 reach their goals of getting stronger and/or losing weight. Most of my members call it therapy. I just like giving people the opportunity to workout on their own time and to push themselves to the level they didn't think was possible. Bloomington has never had anything like this before and, since 9Round opened, members have come and gone. It's part of business; I'm still learning. Not everything is for everyone! But the members that have been here from day one love everything about this place and they would be devastated if I closed down. In the last few months, I made the rent. But the management company sent out a March statement that showed back taxes from the previous year. I had planned to pay the back taxes, but I was not expecting to pay the entirety of the taxes in one statement. From this statement, I have been trying to catch up every month, with little success. Your donations will help pay the rent and buy supplies the members need while in the gym, such as wraps and gloves. That being said, the management company has only given me until August 16th to pay the taxes--or they're going to proceed with the next step. I've giving up a lot to make sure my business stays alive: I take the bus everywhere I go and I work 60 hours every week to make sure things run smoothly. This is my passion: helping others achieve their goals and doing it with a smile on my face every time. People always say that starting a business is tough and you have to stay positive because you will have ups and downs. But I love coming to work everyday, knowing that I'm helping someone feel better about themselves. With your help, I will be able to continue my dream and help my clients acheive their dreams as well. Saturday's workout. This is what you'll expect at 9Round everyday.